Libby's Little Addiction: May My Monthly Hero - Release + Giveaway! May My Monthly Hero - Release + Giveaway! Hello!! It's time for another My Monthly Hero kit from Hero Arts, and I am soooo over the moon in love with this month's main kit and optional add-ons!! Every single one of them!! First a card I made with the main kit. I love the adorable little mermaids in the kit. They are drawn in the same style (by the same artist) as the fairy kit last August, which was another of my all-time favorites. They are so pretty. And I love that they are cute, but also a little more pretty & realistic than some of the other mermaids I've seen. BUT - for today's card I didn't even use the mermaids! I used the sea horses instead. 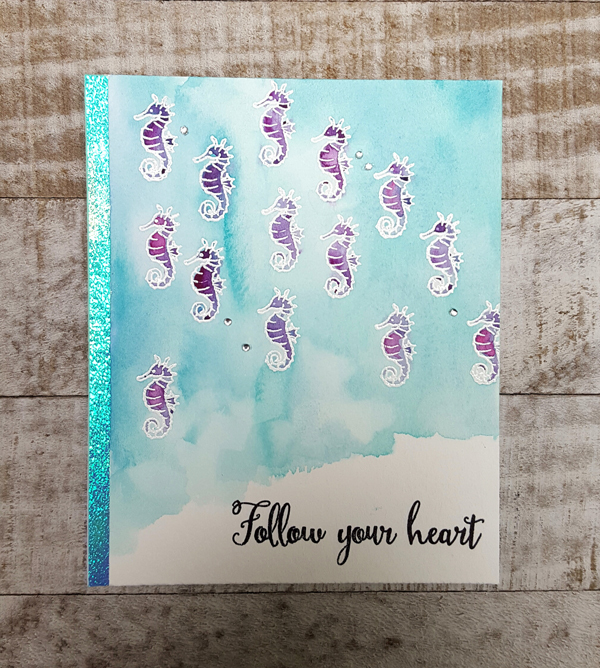 I embossed the sea horses in white, then watercolored them with my Hero Arts Watercolor Dot Palette. The background is a wash of the turquoise, also from the dot card. The message is from the add-on stamp set Mer-mazing Messages, and that strip of shimmery blue paper to the left side is included in the main kit - so pretty!! I'll also show you the card I shared over the weekend on the Hero Arts blog, in case you missed it. Head over to this post for more details - but this one features the absolutely GORGEOUS new woodblock stamp, Mermaid, also launching today. It even has a matching die! Here's a peek at the entire kit. Love!! And now it's time to hop! Please visit all of the links below, and leave comments as you go! 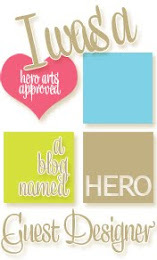 Hero Arts is giving away a kit to one lucky commenter, drawn from the comments left on all of the blogs. You have until Sunday, May 7 at 11:59pm to get your comments in. Check the Hero Arts blog for the winner! 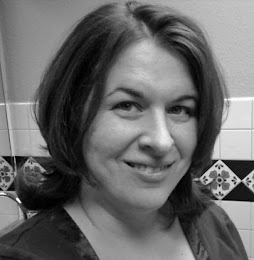 Head on over to Michelle's blog - I'm sure she's made something AMAZING. Then head on over to grad your kit HERE - I have a hunch these will not last long!! Both the card and the tag are great! I love those purple sea horses. Your tag is something else!!! Truly beautiful! I didn't buy the wood set trying not to spend to much but I see it in my future. The sea horses look so cute on the first card and I love the tag you made, too. The new HA kit and the add-ons are SO nice. Pretty purple sea horses, yay! Wow, both the card and the tag are amazing. Really beautiful. Thanks. I love seahorses more than mermaids, so I just love your card! They are so cute! Thanks for mixing it up a bit and showcasing the sea horses. Cute card and tag! Love both of your projects Libby!!!! I am totally drooling over your fantabulous card and tag! The mermaid tag is breathtaking and stunning! TFS! your mermaid tag is so beautiful, I love the shimmer. Woot! Sea horses - love them! Both the card and tag are just beautiful! Love your sparkly mermaid. I'm sure it even more gorgeous in person. Thanks for the inspiration! Stunning! Adore that seahorse card, too cute and the colours just pop! love the tag. it is stunning! I adore your seahorse card! Aww, these sea horses are just adorable! I love this and the colors you used are simply divine! great cards!! great kit! Thank all! I love sea horses they are such odd creatures. Your card is very cute, and so is the mermaid tag. Great job. The sea horses are so cute!! I adore your little seahorses! Isn't that shimmery blue paper the perfect embellishment, here! That glittery ink looks so pretty! Like the multiple sea horse stamping & the sparkle of the glitter on the mermaid's tail. Very pretty. The colors just pop! So cute! I like how you repeated the sea horse image on the front of the card. Thank you for sharing. 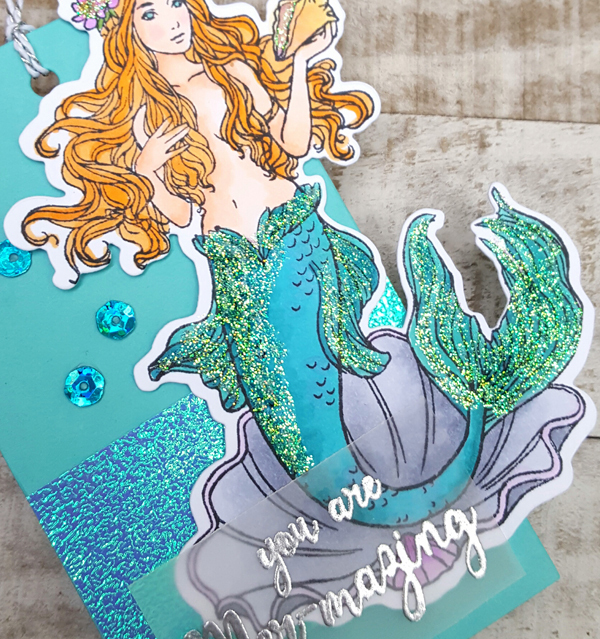 Two fabulous cards- who wouldn't love a swarm of sweet seahorses and a strikingly beautiful mermaid! Fantastic coloring. My first time at your blog, but it won't be the last. Great images. 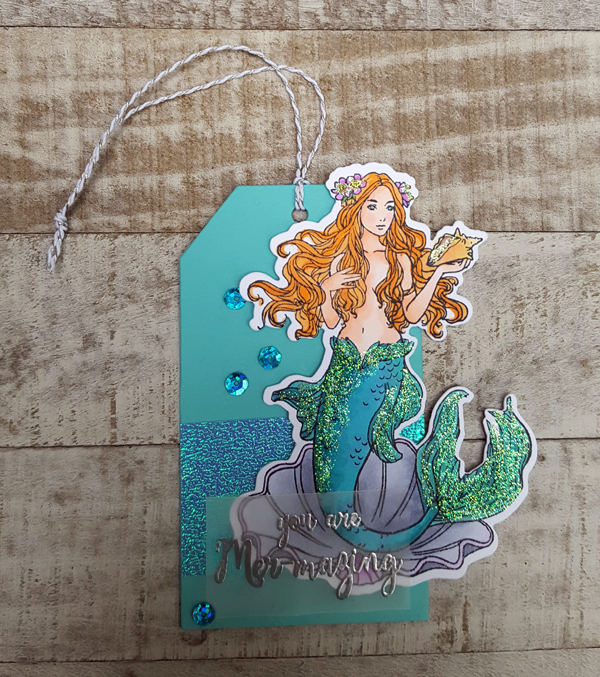 Sweet seahorse card and beautiful mermaid tag. Your mermaid is GORGEOUS! Mermaids and glitter go together like peanut butter and jelly! Love this kit! It's a winner! Beautiful! I love your color use! Love the sparkle on that mermaid!! Beautiful card and tag Libby!! The mermaid tag is stunning. I just love the colors you used and all the glittery detail. super sweet card... love the school of seahorses!! I've been out of town so I didn't see the preview post but I will definitely check them out. I love the mermaid tag! Wow love your sea horse card, and its purple my favorite color. This mermaid tag is the best I have seen her done absolutely gorgeous job. Gorgeous! I love the shine you gave her! Nice card! I like the shimmer on the tag too. Every mermaid needs some shimmer. All are beautiful but your tag is exquisite! This mermaid tag is so gorgeous and the little sea horses are so cute. Thank you for sharing! I just love this kit and all of the add-ons! That paper creates such a beautiful effect. Cute little seahorse card. That mermaid tag is gorgeous. This kit is amazing! The seahorse card is beautiful! That Mermaid with the glitter.. so gorgeous! Both projects are stunning. Sadly, I discovered these kits after the fairies kit, but I am so happy I will get to play with this one. It will be my 7th and favorite thus far. 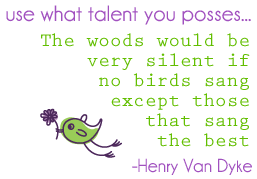 Keep the inspiration coming! Those sea horses are adorable. Your creations are awesome. Your seahorse card is adorable! And I love the mermaid card too! This kit is too hard to resist! Fabulous work with this fabulous kit! Love the water color sea horses. How adorable. Love the glitter on the mermaid tail. That is a lovely touch! Your tag is striking. Great job. wow I love love the tag you made just stunning, thank you for sharing both the tag and the card. Love how your tag just sparkles and glistens. And, those little seahorses, so cute grouped together. What does one call a bunch of seahorses -- a school (as in fish) or a herd (as in houses?! Your mermaid card is so cute! Thank you for sharing your ideas! Very inspiring! Cute creations :) Love the shimmer on the tag! wonderful card - I love seahorses! Both of your creations are wonderfully done. Can't choose a favorite between them. Love these blogs, I always find a new technique to try! Very lovely ideas. Thanks for sharing with all of us. Amazingly beautiful tag. Repeat after me..........must have everything. Those tiny starfish are beyond sweet swimming away on your card. And the shimmery yumminess on your mermaid tag is wonderful! I'd love to win this kit! they make a great card. I love seahorses and I am so glad you used that stamp on your card! I also love your mermaid tag! Gorgeous! The seahorse card is gorgeous as is the tag! Such a fun kit! Thanks for sharing your creations! Sweet projects!! Love this kit!! Beautiful card. I love how you used the sea horses. The tag is awesome. I am so incredibly sad that i missed out on this kit. Beautiful work on both the card and the tag. Thanks for sharing. What a gorgeous card and tag!! Those seahorses are just adorable and that mermaid is just delicious. 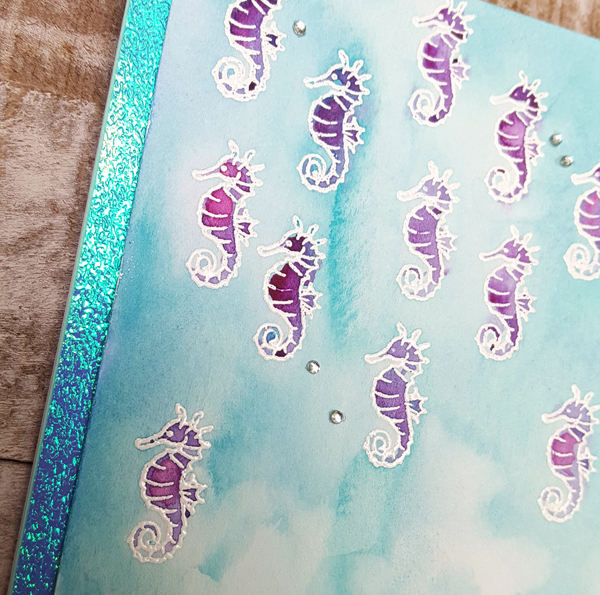 Love your purple sea horses card, it is so gorgeous ! Your tag is also beautiful! Two fab projects to showcase this new kit. Thanks for sharing and inspiring! Loving all the bling! Each time I move along the hop, I decide I need, yet another add on item. You guys are killing me! Really adorable card! Love the colors you used! Truly LOVE that seahorse card!!! Your mermaid is GORGEOUS! and I love he little sea horses. Love the tag! Great idea in addition to the cards. Your card and tag are so pretty! I love the little seahorses and the beautiful watercolor background. Your tag is gorgeous! I love all the glitter and your coloring is wonderful! Stunning creations!Thank you for sharing! Wonderful. Love the tag, but I can't take my eyes off of the seahorses. They seem to mesmerize me. They are soooo cute, and the card is so colorful. Love the shimmery strip on the side too. Oh those tiny little sea horses soo cute! That tag is amazing!! I love the blue shimmery strip you used. Libby, your card and tag showcase the new kit so well. I especially enjoyed all those seahorses! Thanks for sharing your cards and being part of this blog hop. Your tag is so beautiful , and your card adorable! I am so sad I missed out on this kit, but I will buy elementary elements as soon as they are back! Thanks for your inspiration. Love the cards, and tag, the seahorses are clever. Your mermaid is perfect! The painting and every addition is fabulous! Your tag is gorgeous! I just might have to buy that stamp and try to copy you. It's amazing how you can take that simple little sea horse & make such a spectacular card. Speaking of spectacular, I'm loving that tag you made! Love, love the tag! She is beautiful! This kit offers so much versatility from the mermaids to the reef. I would image anyone who live the sea would love this kit. Your card is amazing! Purple seahorses are so beautiful. Thank you for sharing. Love your work and this kit! loving those cute seahorses!! can't wait to get my kit! Great use of the small images on the first card and love the shimmer on the last. I love your mermaid tag - so beautiful, with just the right amount of shimmer & sparkle...just like a real mermaid. Gorgeous kit, too - would be amazing to win something. you create an amazing background! The seahorses are so cute! Great card! Love your card and tag ... love sea horses .. love love love!!! I love the seahorse card - such beautiful blues and purples! But that mermaid tag is just gorgeous, with all your beautiful color and textured and sparkly embellishments you used. Thanks so much for sharing! I love seahorses, the most unusual fish in the ocean. Thank you for sharing your lovely cards. I love the sea horse card. The colors are fantastic. AH!!! I love the Seahorses! Your tag is so pretty. 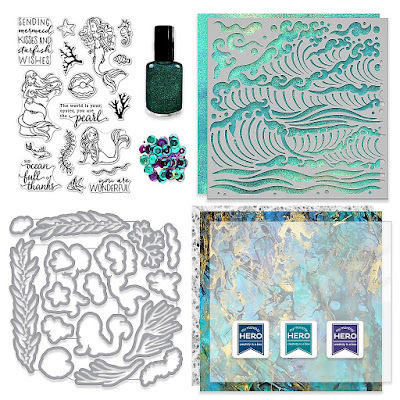 Love all the fun seahorses and your pretty mermaid tag ! Thanks for sharing ! I have a serious seahorse addiction... love this image! The seahorses are just adorable, and your mermaid card is gorgeous! Amazing coloring! Both your projects are so lovely. I love the seahorse card. Such a unique design. Wow- iridescent paper and shiny mermaid tail- beautiful! Those sea horses are so cute and the tag is absolutely gorgeous! I love all the cute little sea horses! I used to have a dried one. I think sea horses are so cute! I also love your tag so much! That is the stamp I love and I love how you colored and embossed yours. You did 1 beautiful card and 1 beautiful tag. Both projects are wonderful. Love this new Hero Arts kit! Absolutely beautiful I so want this kit!!! The little seahorses are so darned cute! The mermaid tag is truly stunning! The colors are perfect and the bling really enhances her. Wow! Your amazing! I especially love the tag!! Gorgeous creations! This kit is my favorite one so far! My goodness those seahorses are cute! 😍😍 And the add on mermaid stamp is one of the prettiest I've seen - love how you made her sparkle ^^ Thank you! SO MUCH FUN! Love these cards and kit! I LOVE the little seahorses!!! But I need to stop following this blog hop because the more I do, the sadder I become. Because I missed the kit. Praying to GOD that they restock it, just this one time. I've never wanted something so bad in my entire life. Love to win! 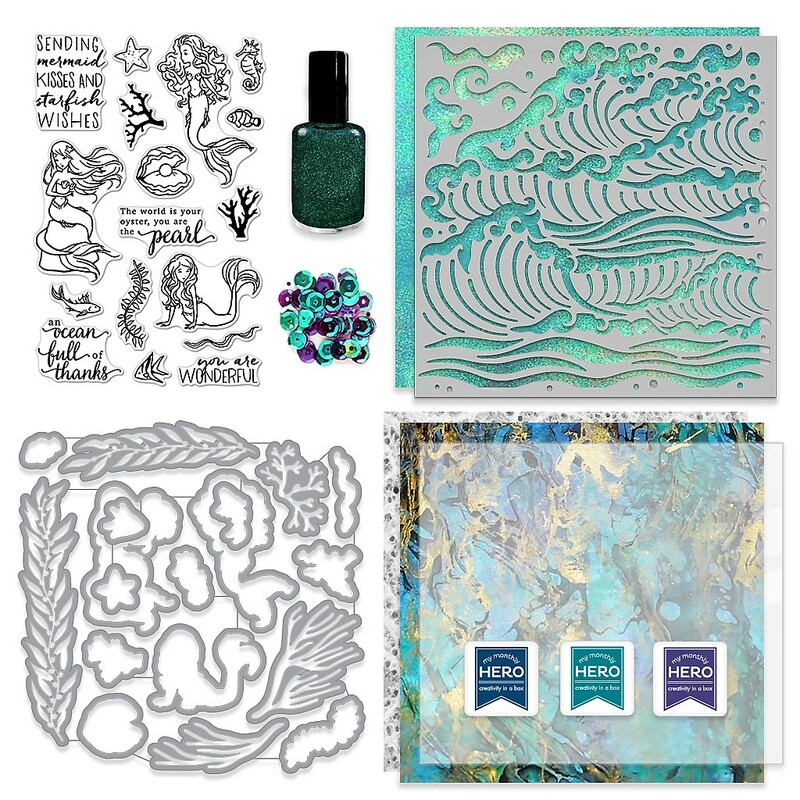 I adore the mermaid stamps and the beautiful papers in the kit ! The seahorses so magical ! This kit is awesome! Such possibilities. Can't wait to play with it! Love your sea horses! The mermaid also looks great with the sparkle and the nice background paper.